Brazosport College has been the College of Choice for southern Brazoria County for 50 years now. From an initial graduating class of 25 students to being named one of the top community colleges in the nation, we have seen tremendous growth and success. Before we look forward to the next 50 years, we’ll spend some time reminiscing on our rich history. We’ll celebrate through special events, concerts and other historical retrospectives. It’s going to be a celebration 50 years in the making! James Barta poses for a photo during a recent visit to Brazosport College. 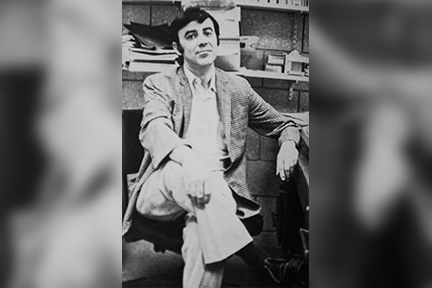 ON HOVER: James Barta works at Brazosport College in this 1975 BC file photo. With nine stand-alone buildings, beautiful water features and eye-catching architectural designs around every corner, the 156-acre Brazosport College campus is well known as one of the area’s nicest locations. But it wasn’t always this picturesque. In fact, the current campus isn’t even where Brazosport College got its start. For that, the College goes back 50 years, in a small building in Freeport, where it spent two years before moving to the land it sits on today. Most people either weren’t around or simply don’t recall Brazosport College from those earliest days. This isn’t the case for James Barta, who not only remembers Brazosport College’s infancy, but also has vivid memories of working for the College during that time. 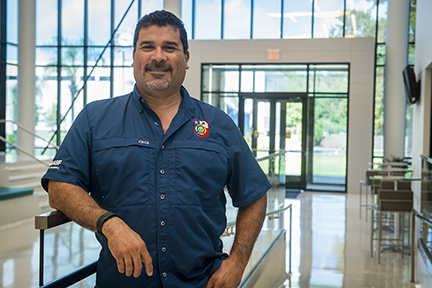 Gus Campos, Brazosport College’s 2018-19 Distinguished Alumnus, has earned two degrees from BC and has excelled during his 30 years at BASF Corporation. If you’re a fan of the Houston Texans, you probably know of Gustavo Campos. 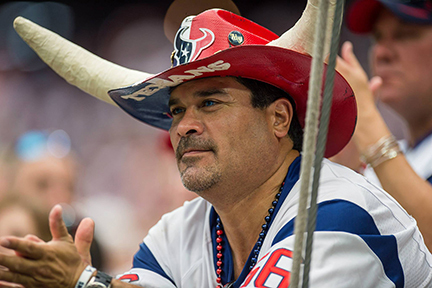 Many might not know him by name, but he’s regularly seen in Texans commercials and is a fixture at the team’s tailgate parties. In fact, Gus and his familiar horned Texans hat can be seen on television at almost every home game when the camera pans toward the spectators in the end zone. The camera has even found him many times at baseball games — in a different, yet just as unique, Astros-themed hat — and other Houston events. Although he doesn’t actively seek it out, the camera always seems to pick him out of the crowd. Tom Kinney, who directed the Brazosport College Drama Department for 30 years, poses for a photo in the school’s 1975 yearbook. 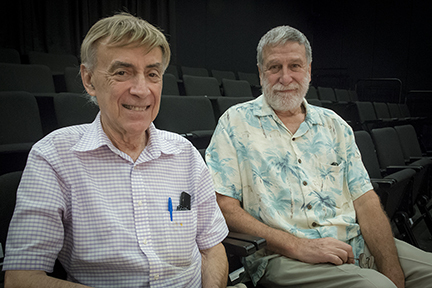 ON HOVER: Tom Kinney, left, and Dana Andersen-Wyman, the only drama directors in Brazosport College’s 50-year history, pose for a photo recently at the Seidule Drama Theatre at Brazosport College. Andersen-Wyman’s drama department is set to present the farce, “Charley’s Aunt,” beginning Oct. 4. Kinney’s “Charley’s Aunt” was the first play presented on the current Brazosport College campus back in 1971. For Brazosport College’s 50th anniversary, the school’s drama department is returning to its roots. For its first play of the 2018 fall semester, the BC Drama Department will present its production of “Charley’s Aunt,” a classic farce comedy that can be enjoyed by the entire family. Opening night is 8 p.m. on Thursday, Oct. 4 at the Seidule Drama Theatre on the Brazosport College campus. The play will have six showings, Thursdays, Fridays and Saturdays, from Oct. 4 through Oct. 13. All showings will be at 8 p.m. and admission is free. 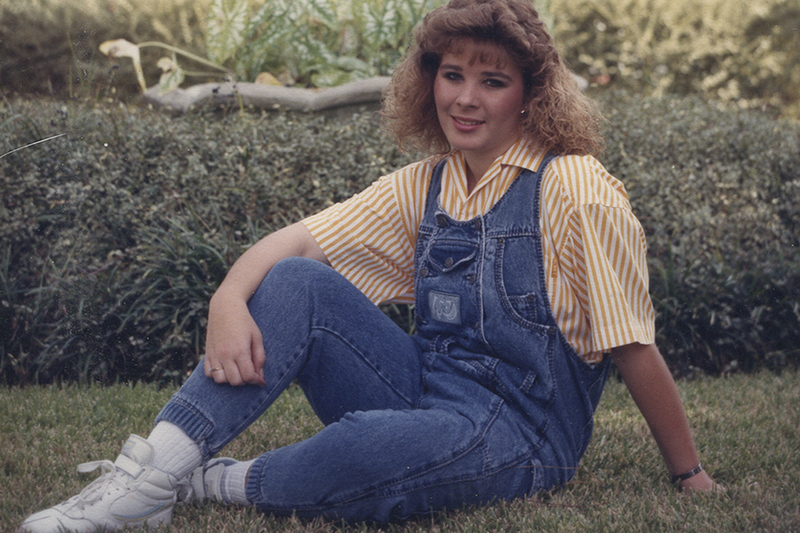 Tamra Buenger poses for a photo in the late 1980s, just before she received her associate degree from Brazosport College. 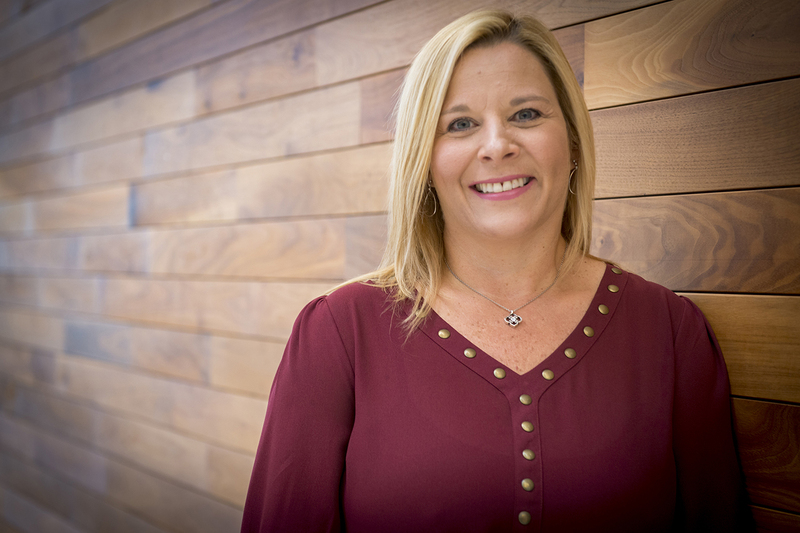 ON HOVER: Tamra Buenger returned to Brazosport College in 2015 with the goal of earning a Bachelor’s in Applied Technology. She has six classes remaining and is expecting to graduate in August, 2019. When Tamra Buenger graduated from Sweeny High School in 1988 she was undecided about going to college. Then a scholarship changed her mind. “I really didn’t know what I was going to do after high school,” Tamra said. “But I did receive a $500 scholarship for Brazosport College, and my mother thought I should at least use the money the scholarship offered, and then I could decide after that. 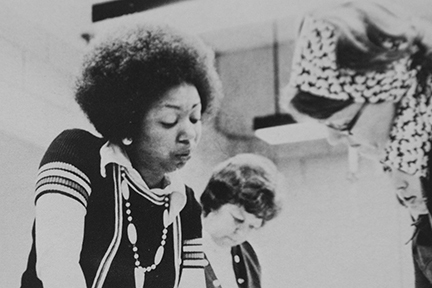 Marva Doss works at Brazosport College in this 1975 BC file photo. 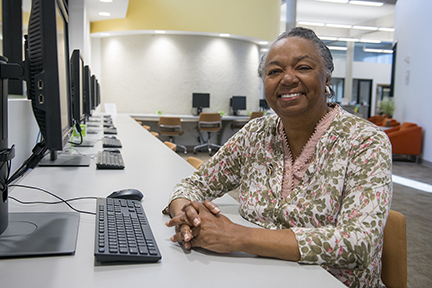 ON HOVER: Marva Doss poses for a photo recently in the Brazosport College Student Success Center. Marva Doss has issues with retirement. To be more specific, she can’t follow through with it. Since she officially stepped away from Brazosport College in 2006, she’s returned to the school as an adjunct professor, a registration counselor, an ESL aid and her current role, a writing tutor. “I really thought I was leaving,” Marva said of retiring from Brazosport College 12 years ago. “But opportunity has presented itself every time. I’m fortunate in that I wasn’t seeking all this. I’ve always been sought after. Brazosport College has been the College of Choice for southern Brazoria County for 50 years now. From its humble beginnings in 1967 and an initial graduating class of 25 students in 1970, to being named one of the top community colleges in the nation with more than 1,000 graduates in 2016, Brazosport College has seen tremendous growth. However, the primary goal has always remained the same: Brazosport College is focused on student success. The first Board of Regents for the Brazosport Junior College District: Dr. W. D. Nicholson, Chairman; R. L. Buell, Vice Chairman; D. V. Collins; M. S. Johnson; Mrs. D. J. (Frances) Landsborough; Dr. B. R. Mayse; Dr. J. A. Stewart; V.S. Sumerford; J. L. Wilson. Dr. J. R. Jackson selected as the first president of the Brazosport Junior College District. Classes began in 1968 with an enrollment of 879 students. Two years later, 25 graduates were awarded degrees at the College’s first commencement ceremony. Voters approved a $5 million bond for constructing and equipping a new college facility to be located at the College’s current site. Two years later, the facility was completed. The name of the school was changed to Brazosport College. Many student groups were formed, including the Student Senate and Phi Theta Kappa. Gators was chosen as the school mascot by a school election. Other name suggestions included Egrets, Blue Herons and Apollos. Brazosport College was fully accredited by the Southern Association of Colleges and Schools and the Association of Texas Colleges and Universities. Staff and faculty numbers increased from 45 in 1969 to 121 in 1975. 54 percent of BC students were enrolled in occupational and technical education, while 46 percent were in academic courses. Dr. W. A. Bass selected as the College’s second president. About 200 people attended a Student Senate-sponsored rally in support of the country and President Jimmy Carter’s attempts to free hostages held in Tehran, Iran. Computer Technology was the fastest growing program on campus. In 1980, Brazosport College had 4 computers of its own. Four years later, the College ordered more than $500,000 in computer equipment. Also, from 1979-1984, the number of computer students increased from 771 to 1,758, while instructors increased from 2 full-time and 8 part-time teachers to 5 full-time and 26 part-time teachers. BC formally dedicated a row of Oak trees in front of the school as “Regent Oaks.” A new, three-tiered, falling-water fountain, designed by local artist Bruce Good, was installed in front of the College. Brazosport College’s student organizations earned excellence awards, as the BC Student Senate and the BC chapter of the Texas Student Education Association were named the best in Texas. BC began its dual-credit program with Brazosport Independent School District. At the time, BC was pursuing similar arrangements with Angleton ISD, Columbia-Brazoria ISD and Sweeny BISD. Dr. John Grable selected as the College’s third president. Brazosport College opened its A-Wing addition, which included a new entrance, game room, registration area, meeting rooms, bookstore, food service and dining area, kitchen, three computer rooms and a Learning Assistance Center. The Center for Business/Industry Training began when the College was awarded its first contract with the Dow Chemical Company to train 2,000 employees in the use of personal computers. Brazosport College became the first widespread Internet provider in the area with its brazosport.cc.tx.us Web address. The BC Foundation was founded to raise funds for the enhancement of educational opportunities at Brazosport College. Brazosport College introduced Distance Learning classes. Dr. Millicent Valek selected as the school’s fourth president. The Board of Regents approved a campus expansion to include a music performance hall, a training facility and a child development center. The Building a Legacy capital campaign, led by the BC Foundation, raised $5.5 million in 18 months. Revenue bonds financed the remainder of the $21 million project. The Board of Regents approved naming guidelines for buildings and classrooms as part of its donor recognition program. The Dow Chemical Company was the first building-level donor recognized for its financial support of the Corporate Learning Center. BC opened the Children’s Center, which was later renamed the Bill & Julia May Children’s Center. BC dedicated the Corporate Learning Center and a new technology wing in 2003, The Clarion at Brazosport College in 2006 and a remodeled Arnold & Janice Seidule Drama Theatre in 2007. The Clarion’s opening concert featured Lyle Lovett. Brazosport College received authority from the Texas Legislature to offer bachelor’s degrees and was accredited by the Southern Association of Colleges and Schools as a baccalaureate-level institution. Classes began for its first baccalaureate degree in Industrial Management with 31 students. Voters approved a $70 million bond referendum to construct and equip buildings outlined in the Campus Master Plan, which included a health science center, a process technology center, a commencement hall and a new campus entrance. The BC Foundation launched the Your College, Your Legacy Capital Campaign and raised more than $5.5 million in support of the BC Master Plan. Brazosport College created its Facebook page. Ten years later, that page had more than 16,000 likes. The Brazosport College Foundation held its first Women’s Lecture Luncheon Series, as well as its first Scholarship Soiree, raising $200,000 for student scholarships. The Master Plan project included the construction and dedication of the BASF Center for Process Technology building in 2009, the Byron & Sandra Sadler Health Professions/Science Complex and the Dow Academic Center in 2011, and the Student Pavilion and an expanded library in 2015. A “Ramp Party” was held to celebrate the end of the popular ramp that accessed the first and second floors of the college’s main campus building. The ramp was torn down a few days later as part of the College’s library expansion. Brazosport College was twice named a Leader College by Achieving the Dream. Brazosport College was named a Top 10 Community College in the Nation in 2013 and again in 2015. The BC Foundation launched its third Capital Campaign and raised $3 million to renovate the College’s construction technology wing and construct a new welding lab. The Freeport LNG Crafts Academy and the BCPC (Brazoria County Petrochemical Council) Welding Technologies Laboratory were dedicated as part of the campus science and technology corridor. The Brazosport College Board of Regents are: Carolyn Johnson, Chair; Robert Perryman, Vice Chair; Jason M. Cordoba; Lucilla Henderson; Roland K. Hendricks; Jane Leidlein, M.D. ; Steven D. Solis; Daniel L. Yates; Rich Wells. Dr. Millicent Valek is serving her 23rd year as president of Brazosport College. Brazosport College employs 652 faculty and staff, including 277 full-time employees, 156 part-time employees and 219 adjunct instructors. Brazosport College awards $812,193 in scholarships to 788 students. 6,154 students are enrolled in Brazosport College’s credit program. Of these students, about 25 percent are taking classes related to the petrochemical industry. 1,748 students are enrolled in Brazosport College’s Community Education program, while 11,566 participate in the College’s Center for Business/Industry Training. 1,604 students attend BC through its dual-credit program in partnership with local school districts. 212 students are pursuing bachelor degrees in Industrial Management and Health Services Management. Brazosport College awards 475 associate degrees, 46 Bachelor of Applied Technology degrees and 470 certificates in workforce programs during the most recent academic year.